I'm heading to Maine for the Mount Desert Island Marathon Relay this weekend and I can't wait! It's been an insanely busy week at work but I've been taking good care of my back and I'm happy to say that last night, I went for an easy 4 miles and felt great! I actually ran slightly faster than goal pace without even realizing it because I was wearing long sleeves and had my watch covered! The first and last time I went to Maine was for mine and The Pilot's anniversary (11 months ago tomorrow!) and I absolutely loved Portland. This time around, I'll spend Friday in Portland before we all (by all I mean about 9 of us or so) caravan wayyy up to Bar Harbor for MDI! Sunday, Ally and I will toe the line for the marathon relay...I think I'm doing the 2nd leg? I should know this, I know. 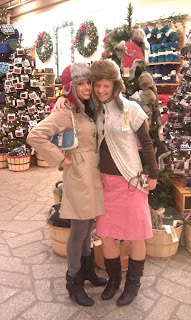 Danielle and I at LL Bean on my last trip to Maine! Can we make this happen again? Monday night, when I got out of work, The Pilot texted and asked if I wanted to go to the Jets game that night. Heck yea I did! I had never been to an NFL game and he had said at the beginning of the season that that needed to change this year and it did! The Jets played abysmally, it was 4 degrees outside and the hot chocolate was really just chocolate flavored water but we had a blast as per usual. I swear, we could have fun in a dungeon. I was REALLY against them calling it Met Life Stadium until I saw all of the Charlie Brown characters at the stadium! So that's that! In other news, I got a promotion at work...which is why this week has been so super busy and I've neglected my poor little blog but hey, I managed to go to a football game with my awesome boyfriend and tomorrow, I'm heading to see my Madrid sister, my RTB relay team captain and Danielle, who introduced me to the glory that is LL Bean...and for that, I am eternally grateful. By the way, can anyone recommend a good domain registration site that works with Blogger? I just bought my domain through Google. Haven't had any problems with it, though I still wish I could just switch to Wordpress! Good luck this weekend! How much of the relay are you covering? Oh the Jets, my BF is not very happy lately. Congrats again on the promotion!!! And good luck this weekend!! Good luck this weekend! 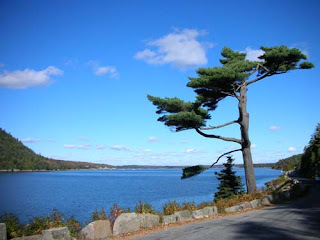 I've always wanted to go to Maine - looks gorgeous! So glad your back is feeling better! I'm kind of done with marathons for now but MDI is a marathon I would like to do. I hope you have great weather and a lot of fun. I'm glad you had a chance to go to the Jets game. As a Pats fan I can't stand them but I love that stadium!